England’s Luke Donald missed a chance to match Phil Mickelson for the clubhouse lead Friday in the first round of the storm-hit US Open by missing a four-foot par putt on the 18th hole. Donald, seeking his first major title, reached four-under par after 13 holes by making birdies on his last three holes before darkness fell Thursday, when two thunderstorms stopped play at Merion for about four hours and 15 minutes. But when the round resumed Friday morning, Donald faced the toughest five holes on the layout in cold conditions with wind from the north rather than the south as it had on Thursday and he took bogeys at the par-4 16th and 18th. That left the 35-year-old former world number one on two-under par 68, one behind US left-hander Mickelson and one in front of Belgium’s Nicolas Colsaerts as the round neared an end and round two loomed quickly. “Those last five holes are very tough,” Donald said. A host of failed rivals proved his point. Other potential contenders stumbled as well, including world number one Tiger Woods, who followed a bogey at 12 with a seven-foot birdie putt at the par-3 13th but made his sixth bogey of the round at the 17th to finish on 73. Woods, seeking a record-tying fourth US Open title and his 15th major crown, has not won a major title since the 2008 US Open. While he appeared to struggle with wrist issues Thursday, Woods said he was fine. Third-ranked Masters champion Adam Scott of Australia, three-under through 11 holes when darkness came Thursday, stumbled back with a bogey at the 12th, another at 14, a double bogey at 15 and another at 17. That left Scott on 72, one stroke ahead of world number two Rory McIlroy, who closed with bogeys at 15, 17 and 18 to join Woods on 73. A birdie at the 10th lifted British Open champion Ernie Els of South Africa to two-under but three bogeys in a row starting at the 14th dropped him back. American Kyle Stanley, who only qualified by reaching 60th in Monday’s world rankings, birdied 11 and 13 to reach two-under but a bogey at 15 and double bogey at 16 sent him staggering back. The morning also saw two oddities, American Dustin Johnson holing a shot from the fairway on the fly for birdie and Sweden’s Carl Pettersen having his ball struck by another ball while he was on his backswing in the fifth fairway. Pettersen replaced his ball and kept playing. Set for an afternoon start in round two was Mickelson, the five-time US Open runner-up who yearns to finally claim the trophy. “If I never get that win, then it would be a bit heartbreaking,” he said. The US left-hander, who turns 43 on Sunday, played on little sleep after a cross-country flight to attend his daughter’s Amanda’s eighth-grade graduation, but fired three birdies after an opening bogey to seize the lead. 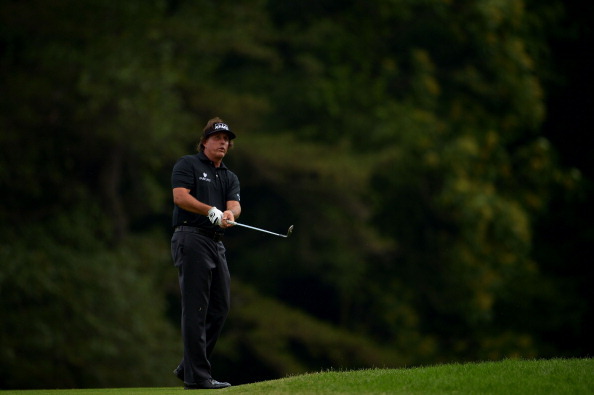 “It might be abnormal, but it actually worked out really well,” Mickelson said. Despite drenching showers three times in the past week, Merion has proved a tricky test for golf’s top talent. “We had the best opportunity to score low and we are all struggling because it’s such a penalizing golf course,” Mickelson said. “It’s a course that’s withstood the test of time and it’s challenging the best players in the world. Some players were set for as many as 32 holes on Friday with the last second-round tee times at 5:57 p.m., giving little hope of making the cut before Saturday morning.